During the 1920s, a number of Russian artists living and working in Paris formed the L’Union des Artistes Russes. To help raise funds they held several spectacular charity balls, organized primarily by Natalie Goncharova (1881-1962) and her husband Mikhail Larionov. These included the Grand Bal des Artists, (alternately: the Grand Bal Travesti Transmental) in 1923; the Bal Banal in 1924; the Bal Olympique (alternately: the Vrai Bal Sportif) also in 1924; and the Grand Ourse Bal in 1925. A collage poster for the Bal Olympique was created by the Russian-born artist Pavel Tchelitchew (1898-1957), who was introduced to Goncharova through Sergei Diaghilev and the Ballet Russe. Tchelitchew lived in Berlin between 1821 and 1923, and had only just arrived in Paris when he collaborated with Goncharova on the Bal Olympique. She often asked fellow artists to create original posters for a pre-ball competition and charity auction. This may be one. 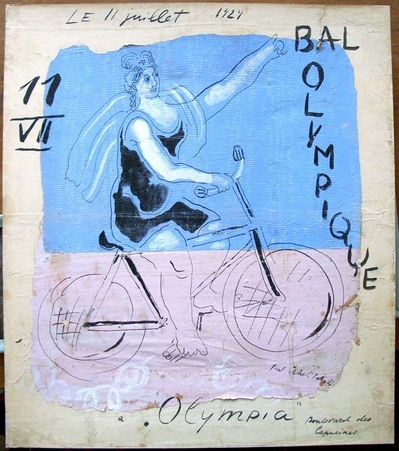 The program for the Bal Olympique featured dances and choreographic events by Olga Koklova and the Ballets Suédois; “danses du homard, crabe et crocodile” with costumes by Vassilieff and Léger; boxing matches overseen by Foujita; a “Spectacle sur l’Échelle” by Tristan Tzara; “poëmes en relief” by Iliazd and Kakabadze; a “nouveau système de projections fantastiques” by Larionov; and much more. Tchelitchew only spent ten years in Paris before moving to the United States with his partner, the writer Charles Henri Ford (1913-2002). More of his work can be found in their journal View (RBSC EX Little Magazines).